A grey and brown tabby kittens are curled up amid the flowers watching a dragon fly. 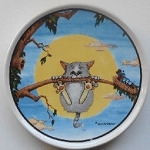 This sun catcher with kittens is 3 1/4" high x 4 1/2" wide. Chain for hanging. 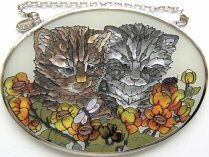 Hand painted, art glass, lead free.